Using the Parkes radio telescope in eastern Australia, Dr. Mary Putman of the University of Colorado and her colleagues appear to have settled a decades-old controversy about the nature of gas clouds that surround the Milky Way Galaxy. Small 'high-velocity' clouds of hydrogen gas seen outside our Galaxy are mostly scraps shed by satellite galaxies orbiting the Milky Way, the researchers say - a kind of cosmic dandruff. The clouds are not associated with the 'missing' clumps of dark matter predicted by the 'cold dark matter' theory of galaxy formation, the team concludes. Dr. Putman will present the findings today at a meeting about our Galaxy and its neighbours at the Space Telescope Science Institute in Baltimore MD. Dr. Putman and her colleagues in Australia used the 64-m (210-ft) CSIRO Parkes telescope to make the most detailed study to date of the Magellanic Stream -- a ribbon of hydrogen gas trailing from the Milky Way's largest satellite galaxies, the Large and Small Magellanic Clouds. They also studied the high-velocity clouds that surround the Stream. The research was made possible by the power of a 'multibeam' receiving system on the Parkes telescope. This allows the telescope to see 13 times more sky at once than it usually can, slashing the time needed to image large areas. The high-velocity clouds were discovered 40 years ago but it has been very difficult to determine exactly how far away and how massive they are. Their nature and origin have been controversial. Some of the high-velocity clouds are associated with the Magellanic Stream, the researchers found. Others appear to be shed by other satellite galaxies. A simulation of the gas in, and streaming from, the Magellanic Clouds -- satellite galaxies of the Milky Way. When seen with a radio telescope on Earth, the long tidal streams of gas stretch from horizon to horizon. Simulation by Daisuke Kawata, Chris Fluke, Sarah Maddison and Brad Gibson, Swinburne University of Technology, Australia. The simulation uses 56,000 gas, stellar, and dark matter particles to represent the Magellanic System. "We now have pretty conclusive evidence that the high-velocity clouds are not scattered throughout our Local Group of galaxies, but are within the extended halo of the Milky Way," said Dr. Putman. "Previous studies of other galaxy groups haven't found any counterparts of the high-velocity clouds," said team member Dr. Lister Staveley-Smith of the CSIRO Australia Telescope National Facility. "If the clouds are there, they must lie close to the big galaxies rather than be scattered throughout galaxy groups." The standard model of galaxy formation predicts that there are hundreds of small lumps or 'halos' of 'cold dark matter' scattered throughout the Local Group. But researchers have failed to find them. It has been suggested that the high-velocity clouds might be those objects. But the new observations imply that this is highly unlikely. "If the dark matter halos the models predict are there, they can't be associated with large amounts of cold gas," Dr. Putman said. "We don't find the gas clouds at large distances from galaxies." "High-velocity clouds are fantastic probes of the properties of the Milky Way and its halo," said Dr Staveley-Smith. "But the question of whether they individually contain much dark matter remains controversial." 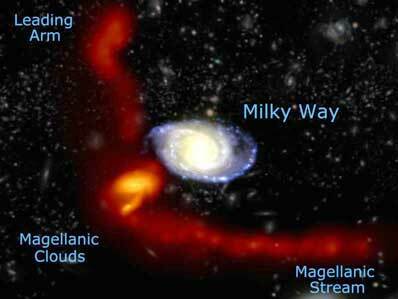 Some high-velocity clouds cross the Magellanic Stream at right angles near the South Galactic Pole. They also lie along the line of sight to the nearby Sculptor Group of galaxies. It had been suggested that these clouds might lie within the Sculptor Group, not the Local Group of which the Milky Way is a member. But the team found no evidence of this, Dr. Putman said. "These clouds are found only towards the southern part of the Sculptor Group. Towards the northern part we see none. If they were there, we would be able to see them," she said. "The velocities and spatial distribution of those clouds also argue against them being members of the Sculptor Group." Instead, the clouds are probably shreds of a small satellite galaxy that has now been swallowed by the Milky Way, she said. One possible candidate is the Sagittarius dwarf galaxy, discovered in 1993, which is being gobbled up by our Galaxy. Other work has shown that satellites to spiral galaxies appear to prefer polar orbits, said Dr. Staveley-Smith. "That would lead to a pile-up of 'litter' about the Galactic Poles as many satellites travelled through those regions," he said. Although this is the explanation the researchers favour, they also say the clouds lying towards the Sculptor Group might be the result of some kind of fountain of material from our Galaxy, or an interaction between the Galaxy and the Magellanic Clouds. The members of the research team were: Mary E. Putman (Center for Astrophysics and Space Astronomy, University of Colorado); Lister Staveley-Smith (CSIRO Australia Telescope National Facility); Kenneth C. Freeman (Research School of Astronomy and Astrophysics, Australian National University); and Brad K. Gibson and David G. Barnes (both at=20 the Centre for Astrophysics and Supercomputing, Swinburne University of Technology, Melbourne, Australia). The Australia Telescope National Facility is a division of CSIRO (Commonwealth Scientific and Industrial Research Organisation), Australia's largest research entity.